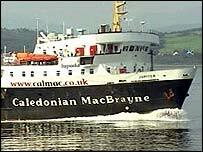 Caledonian MacBrayne has been using taxpayers' money to offer secret discounts on one of its ferry routes, BBC Scotland has learned. The price cuts were designed to lure customers away from rival Western Ferries, which has claimed the move was in breach of UK and European rules. The Gourock to Dunoon route is the only one where CalMac faces competition. Its service receives a subsidy of more than £2m from the Scottish Executive, which owns the ferry company. The subsidy is only meant to support foot passengers, with vehicle tariffs left to face market forces. Now the executive has conceded that CalMac has used the subsidy to underwrite discounts of up to 70% to hauliers. Western Ferries is calling on Audit Scotland to investigate the matter. An executive spokesman indicated that ministers had been unaware of the discounts, which have now been stopped.